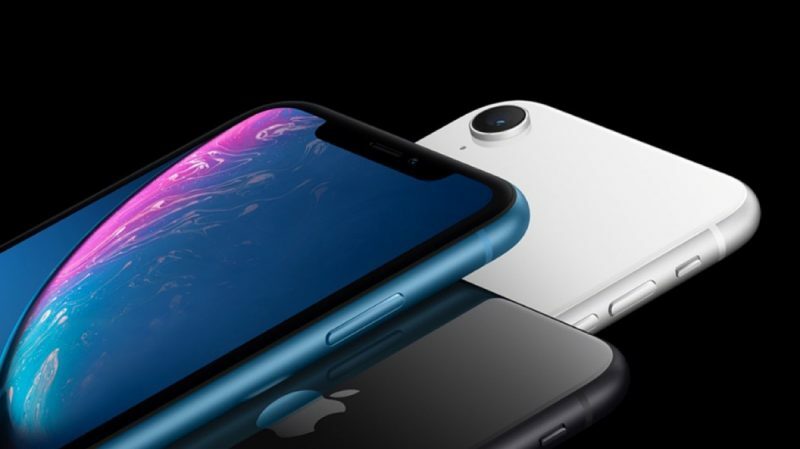 Apple today announced the iPhone XR featuring an edge-to-edge "Liquid Retina" LCD display with wide color and True Tone support, and the same all-screen design as the iPhone Xs and Xs Max, but with an aluminum frame instead of stainless steel. Comparatively, the iPhone XR has a bigger display (6.1-inch) than the iPhone 8 Plus (5.5-inch), but a smaller overall body, and comes in six colors: White, Black, Blue, Coral, Yellow, and (PRODUCT)Red. A seven-layer color process gives the glass back nuanced hues, and the aluminum band and camera trim are color matched. The new design also supports Qi wireless charging, is splash and water resistant with a rating of IP67, and protects against everyday spills including coffee, tea and soda. The iPhone XR uses LTE Advanced for faster download speeds and introduces Dual SIM through the combined use of a nano-SIM and digital eSIM. Otherwise, the iPhone XR has many of the same gestures and features as iPhone X, with swiping up to unlock and no home button. iPhone XR does lack 3D Touch, but instead includes a new feature called "Haptic Touch," similar to the Force Touch found on MacBook Pro trackpads. The iPhone XR is powered by Apple's A12 Bionic chip with next-generation Neural Engine, and includes the TrueDepth camera system first introduced in the iPhone X, along with faster Face ID, and a more advanced camera system capable of portrait photos via a single camera lens. New Depth Control allows users to adjust the depth of field both in real-time preview and post-capture, while improvements to the ISP, Neural Engine and improved software algorithms enable portrait photos with a signature bokeh effect. New smart HDR feature also brings better highlight and shadow detail across photos, according to Apple. iPhone XR will be available in 64GB, 128GB and 256GB models in the aforementioned colors, starting at $749. iPhone XR will be available to pre-order in more than 50 countries beginning Friday, October 19, with availability in stores beginning Friday, October 26. Can’t even hit 699. Pathetic greed. Surely Phil has enough ill-fitting Dad jeans by now. Apple is pricing themselves out of the market. Bye Felicia. Even Phil realised most people are going to see through that lame justification. They don’t even really bother to try and hide their sheer naked greed anymore. Jesus, not a single positive comment yet? You are all nuts. This isn't the phone for me, but it's pretty impressive what they did for an LCD phone. I'm sorry but this resolution on a 2018 phone... even midrange smartphones from other manufacturers have higher resolution. I am sure its still going to sell well though. Price makes you want to throw-up, right? Ugly notch coupled with ugly flat UI.